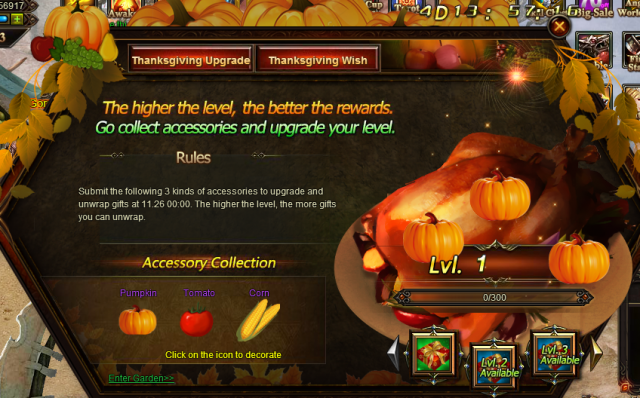 Equip Your Heroes with Thanksgiving Equipment! 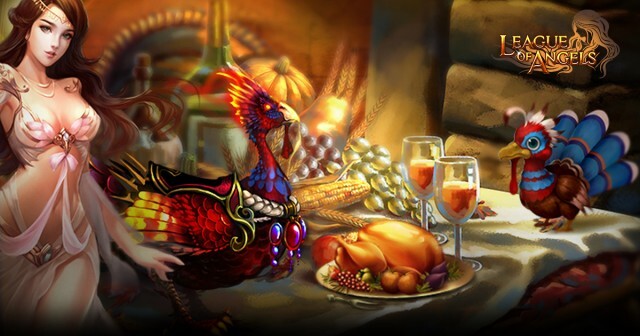 As you are preparing for your own Thanksgiving, League of Angels has also prepared a new Thanksgiving event just for you! 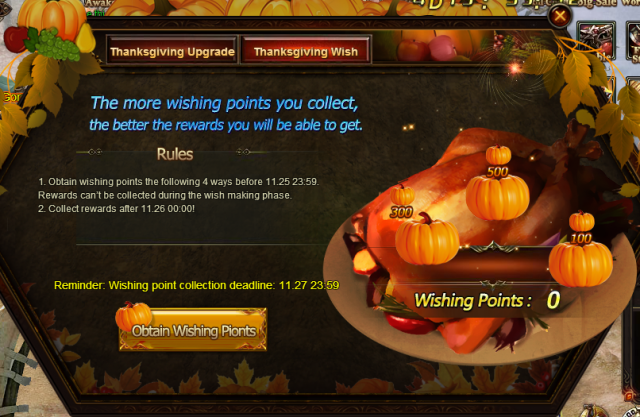 From Nov.21st to Nov.25th (server time),decorate your own Thanksgiving table and obtain wishing points, and you will be able to claim lots of rewards. Rewards include the special Thanksgiving Equipment. Come and learn more about it! 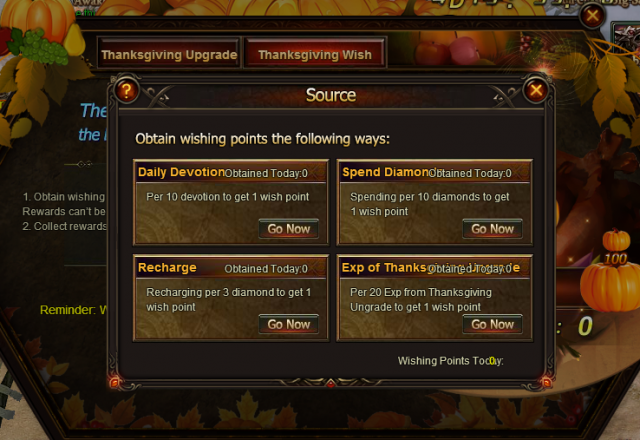 The event is made up of two parts: Thanksgiving Upgrade and Thanksgiving Wish. The more wishing points you get, the better rewards you will be able to get. The higher the level, the better the rewards. Decorate the Thanksgiving Table as you like. Pumpkins, tomatoes and corn are all at your disposal. To decorate 1 time requires 10 Pumpkins, 10 Tomatoes, or 10 Corn. Remember: The more wishing points you get, the better rewards you will earn. To give players a chance to get a lot of points, there are four ways to obtain the points. 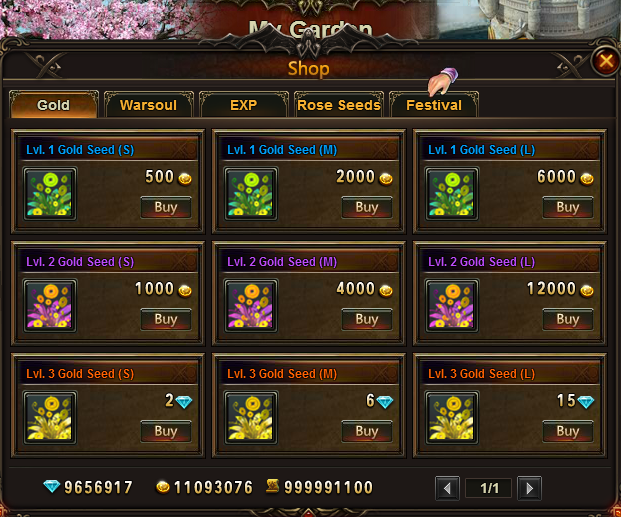 All the accessories will be available in the Garden Shop. Enter Garden and start planting them now! Additionally, you can also find them in Hot Events and Shop. Go get 'em! Thanksgiving Equipment! Open the gift boxes and equip your heroes! Use them to triumph over your enemies! Hope you will enjoy this new event and explore more ways to play League of Angels!